Yoko Ono set out to set a new world record Tuesday (10/6), but fell well short of attracting the number of people she needed to get it done. 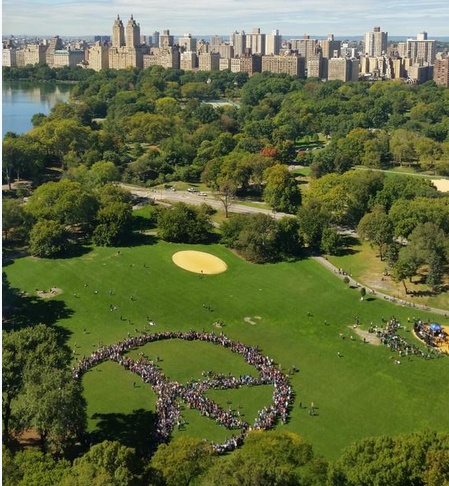 The goal was to get 6,000 or more people to join her in Central Park and form a giant peace sign in tribute to John Lennon. Despite perfect weather, fewer than half that number turned up. Our first thought was, why a Tuesday? John's birthdaywill be on Friday. If it was going to be done on a day other than his birthday, why not do it on a Saturday or Sunday? Our second thought was that a good % of Lennon fans just wouldn't be inclined to participate in something Ono was organizing. Ithaca, New York's Guinness Record, 5,814 in 2009, still stands.